Do You Want to Start a Business or Invest in Bangladesh? Start a Business or Invest in Bangladesh? 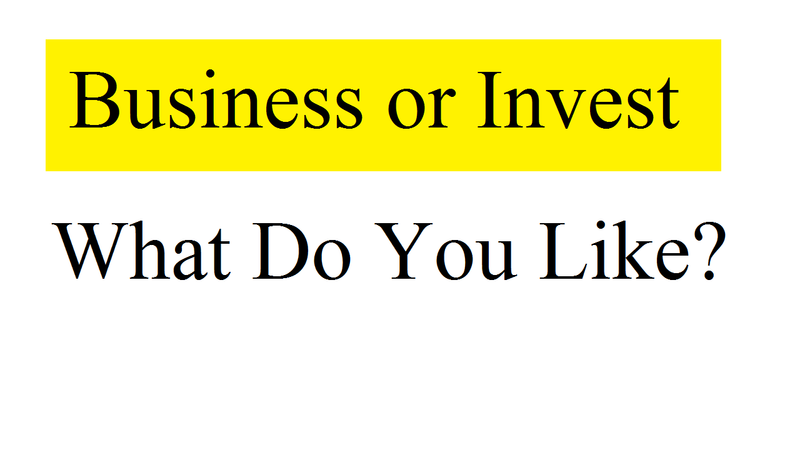 You must be thinking which one is the best, start a business or invest? This is because the current global events are affecting our investments along with slashing our retirement and stock portfolio. Before taking a final decision, let’s look quickly at a business or stock markets invest. Although starting your own business from the bottom up can be a daunting prospect, the dream of being an entrepreneur appeals to many people. But, you must weigh your likelihood of success when you choose an investment. Hoping it pays you a return, or you can opt for investments like stocks, you can put money into a business. With stocks you buy shares of a company, you can get paid a fixed amount. You own shares in a business when you own stocks. This is the thing that completely differs from your own business. If you invest BDT12, 00000 (approximately US$15, 000), it could be something BDT20, 00000 (approximately US$ 24, 000) within a few months to a year. Besides, if you invest the same amount in the post office bonds for a 3-year term, you’ll get a 3-monthly basis profit. That’s something BDT30, 000 (US$380). This is a fixed amount that you’ll get from the government investment, which is completely safe and secure. Also, there are private investment options where you’ll get more profit, but there are some risks to lose your basic capital. But, when you invest in business ventures, you’ll get the chances of earning a lot of revenue. Which is the Best Business or Invest in Bangladesh? In this article, we’ll look at some alternatives that deliver many of the benefits while avoiding some of the drawbacks to investing or starting a business. You may be able to find one that will give you the experience you are looking for while minimizing the difficulties of entrepreneurship while exploring the alternatives. Also, there are attractive tax benefits to owning a business. If you start a business, you’ll get a large list of benefits, including sovereignty, flexibility, arrogance, accomplishment, write-offs, social contribution, job creation etc. Besides, if you invest in the bond or in other options, you don’t have many things to think about. You’ll get an amount per month or per 3-month. But, when you’re a business owner, you’re engaged with some responsibilities and duties. Although you can set them as you wish, you have to stay more active than those who invest in the bonds or share markets. Also, you may need getting loans from banks or from some private organizations to establish your business venture. Now, let’s know about some points that’ll make you clear which is the best business or invest. Not only you should expect to get your original investment amount back but you also should expect a profit on your investment. It carries a lot of risks while investing directly in a business. This is because more than 15% of all businesses failed in Bangladesh since last 15 years according to a report. And the failure rate is the half of all in the first five years. But, the business will continue earning income if you buy stocks or bonds of a company. The profits were more once upon a time in the stock market, but it’s currently in the bonds. If you talk about a business, it may or may not offer financial security. So, the decision is yours what you’ll choose, stock shares, bonds or business ventures. You can either ask for regular payments or a percentage of the profits when you invest in a business. You receive income from your investment as long as the company prospers. So, when you want to get growth by sharing in the profits, this is a great opportunity. Also, you may make a fortune off your original investment if the company is extremely successful. Moreover, some provide income in the form of dividends and stocks can grow in value. With smaller companies that haven’t fully established themselves, this income and growth tend to be higher. However, small companies are more prone to failure than the big ones. Besides, there are bonds for income and you can buy them setting a percentage rate for the investment period. As you can sell them for a profit, some bonds grow in value. As the proverb says, no risk no gain, you can’t do something big without taking a risk. It’s almost the hard-and-fast rule in investing. You’re looking at a high-risk investment when you expect an investment in the business to double or quadruple your money. The average return on the stock market has been 7.2 percent for any 20-year period where your investment in stocks could yield an upside surprise by doubling your money. Besides, if you ask about a bond, it pays a set interest rate at the time you make your investment. As a result, if you look for a big one, you can’t help starting a business investment. The things making money and getting money on your hand are not the same. What the liquidity means that is the ease of converting your investment back into cash. Because these exchanges attract millions of investors daily, stocks can be very liquid. The number of time regulators allows for a stock transaction to “settle,” when you can sell stocks on these exchanges in a day and have your funds in three days. It means that the buyer’s cash to arrive in your brokerage account where bonds take longer. Even, you might have to wait several days if you offer your bonds for sale through a discount brokerage. Besides, it could require the owner to sell the business or raise cash to pay you off to get your money out of a business you have invested in directly. It’s the least liquid of your options while investing in a business. So, the main things are showed and it’s your turn to select business or invest.